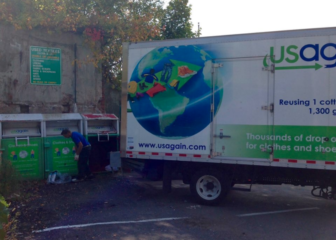 When the USAgain bins near the Swap Shop and transfer station building fill up, the contents are removed to a truck like this one. Usable or unusable clothing, shoes, linens & accessories (backpacks, purses, hats, gloves, belts, etc.) can be recycled in these bins. 2) payment of $200/ton for textiles collected. Recycling textiles also saves natural resources and is a source of affordable clothing for people world-wide. — an announcement from the Darien Recycling Center on Facebook (we’ve changed the punctuation). Like that page on Facebook and you can get your tips directly, as soon as they come out, and keep informed on other recycling information. Editor’s note: There’s another USAgain bin at Person-to-Person on the grounds of St. Luke’s Church, 1864 Post Road. And here’s a locator for bins on the USAgain website.